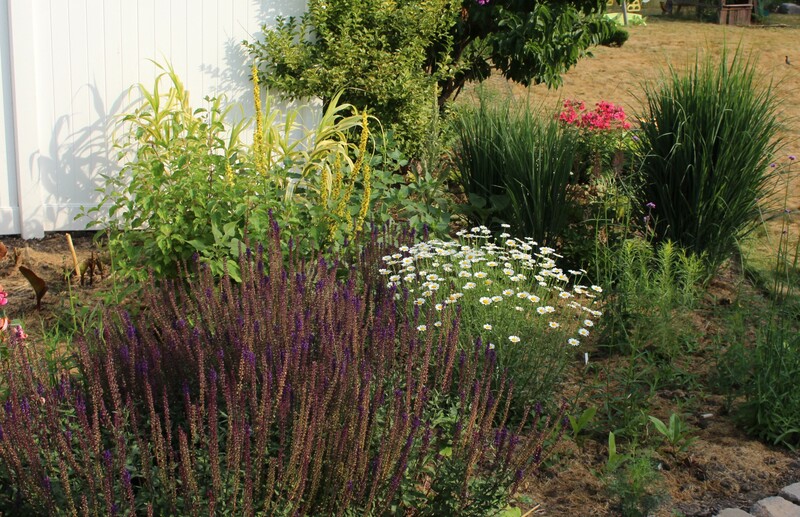 I started planting all the true tropicals and annuals about two weeks ago, and although they’re beginning to put on some weight it’s still the scattering of perennials which give all the color. As you can guess from looking at the lawn we still haven’t had any decent rain. The tropical garden in the first week of July. The red of the rose ‘Black Forest’ carries over from last week and the orange lily has opened up. 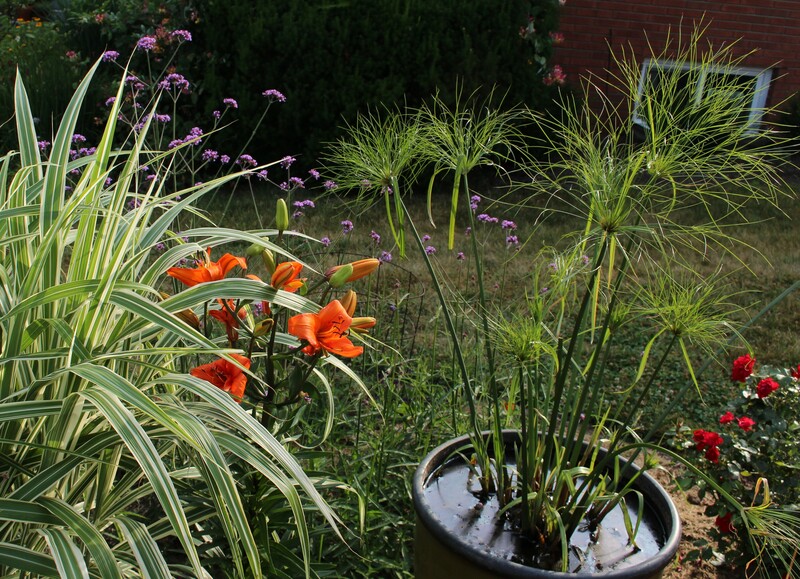 Water is not an issue for the papyrus though since it’s sitting submerged in a planter which lacks a drainage hole. The green algae has passed its peak and the water looks much less stagnant. I may even throw a few fish in this week to keep the mosquitos from breeding. The orange lily ‘Liberty Hyde Bailey’ should have been fantastic this year, but I suspect my MIL may have hit it with a bit of stray weedkiller this spring. The flowers don’t open properly, are a little on the small side, and look stunted in general. Fortunately the bright color makes up for the stunted-ness. You may have noticed the purple haze of Verbena bonariensis which is beginning to develop over the bed. Because of the mild winter several plants of this borderline hardy perennial survived and are already beginning to put on an early show. 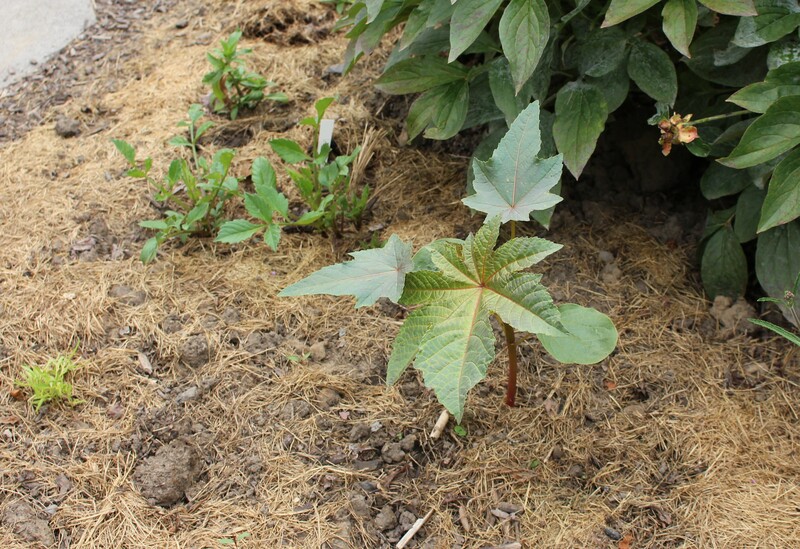 One of the castor bean seedlings (Ricinus communis) beginning to pick up speed. If all goes well a few leaves should reach a foot or more across. This isn’t the first year I’ve had a late start to planting the tropical bed. There are so many other jobs to attend to before this reaches the top of the list, plus there’s always procrastination and general laziness on my part. Fortunately I’m a quick learner and have picked up a few tricks along the way, one of which is “The lazy man’s canna and dahlia pre-starting method”. Rather than potting roots and tubers up and getting them going in a greenhouse or other gardening luxury, I drag the storage tubs out onto the (full, hot-sun) driveway, open tubs and bags, try to orient growing point up, and spray a little water on them all. Less water is better than too much, and over a week (or three) the shoots begin to grow and the break out of dormancy in a way which I feel is quicker than planting them straight into the cooler ground. I’d show you pictures but the mess of trays and tubs and bags spread out in front of the garage is a bit embarrassing. 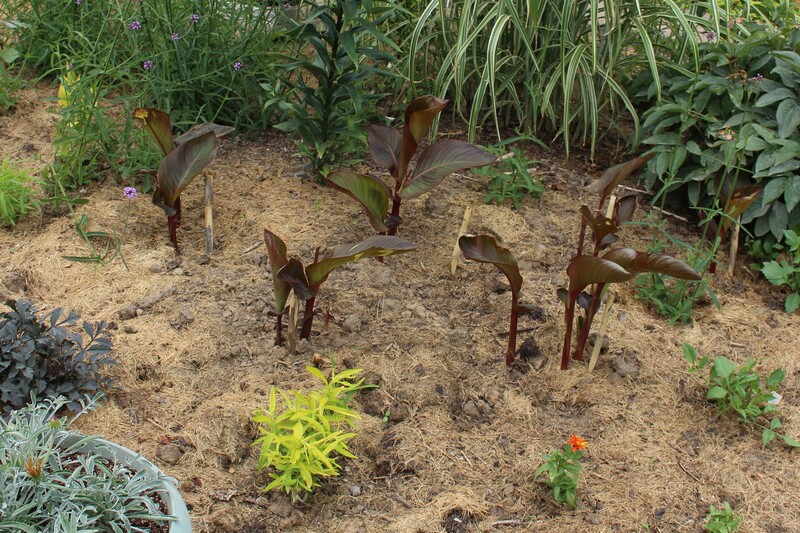 A few of the cannas are already over a foot tall just maybe ten days after planting. While we wait for the tropicals, the perennials continue to have their moment. The purple salvia ‘Caradonna’ is already fading, but there’s an interesting Verbascum showing off behind it. Normally this would pass unnoticed as a sea of sunflower seedlings takes over this end of the bed and overwhelms everything in it, but this year I’ve manned up and stood up to the little thugs. One by one I pulled sunflower seedlings out and although it was nearly sinful composting such healthy volunteer plants, it was also a bit cleansing. I’m ready for something different here. I was hard on the sunflowers but apparently still let a clump of daisies pass through… oh well. 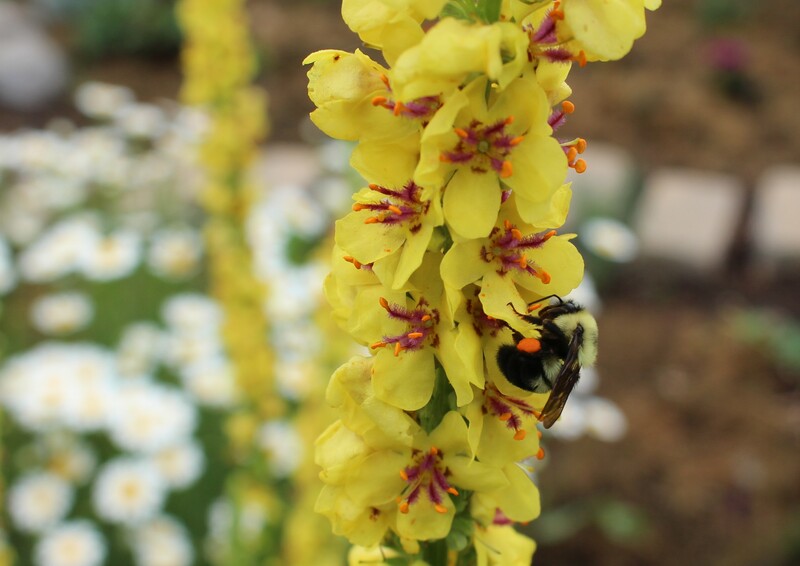 A sharp eye can make out the yellow spikes of the Verbascum just slightly left of center in this photo. So that’s where we are this week. Both Kimberley at Cosmos and Cleome and Cathy at Words and Herbs are also following views each Tuesday and it’s a great way to follow the changes which happen throughout the season. Give Cathy a visit to see what others are up to , and if you happen to join in please leave a link at Cathy’s blog so we can find you. Have a great week! 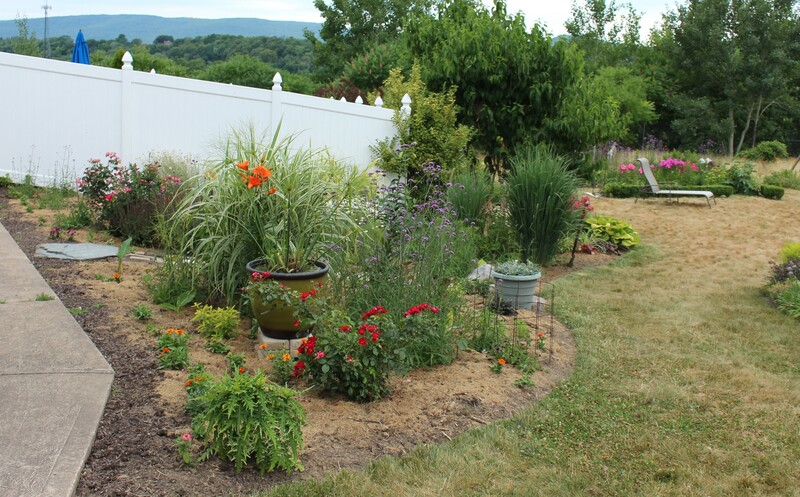 This entry was posted in early summer, perennials, Tropical garden, Tuesday view and tagged flowers, garden, perennial flowers, Tuesday view. Weed killer? Oh No! So bad! The tropicals are off to a fine start! There is still a lot of Summer to be enjoyed – and I know you will, in your gorgeous garden! I’m pleased you chose this bed to follow; already I understand better how you go about filling it and what structural plants you have. I hope the bed goes through several changes, it’s nice to see things growing all summer when other plants are shutting down. Enjoyed your cheetos observation. Many flowering plants seem to specialize in that. The pollen looked particularly orange, I don’t think I’ve ever seen that before. One of my seedlings also just wilted. No idea what the reason was. Hope yours survive, as they will look so good in your tropical bed. I did! I did notice your Verbena B! I am excited that I finally found some this year at a local nursery, so I bought three and stuck them around the rock garden. Hopefully they’ll reseed next year, and I won’t pull them out thinking they’re weeds! Speaking of weeds, I had weed killer issues, too, this year, courtesy of our landscaper. Had to replace a couple dozen marigolds in the Terrace Garden. I occasionally get a wild Mullein popping up on our back hill, in the “lawn”, and we usually just leave them. I’m glad you showed your Cannas, and I like your starting method! Whatever works, right? You were hard on your sunflowers, and I was hard on my Cosmos this year. I usually let them grow in a bed with a pink Knockout rose, at the corner of my garage, where by August they are too big and unwieldy and no amount of staking keeps them off the sidewalk. So this year, I chose 8 of the strongest seedlings and transplanted them to the Terrace Garden, and composted the rest! I’ll enjoy watching this the rest of the summer, and I’ll have to make a point of stopping by to see it in person soon! Good for you keeping those cosmos in line! I always like letting things ‘find their own way’ but all of a sudden I’m fed up with the messiness and need a way out… but by then of course I’m too invested and have to see things bloom or fruit. It’s a vicious cycle lol! I hope your verbena does well. I saw the photos and wonder if it’s the same kind as mine or some strain with slightly larger flowers. It looks great! I find it only reseeds on exposed soil. Any mulch and you won’t see a thing! Good to know about the mulch! Thanks! I think your pre-starting method for cannas must work pretty well. I potted mine up in late April and dragged them in and out of the house during May before planting them out in June, and mine don’t look any taller than yours. Carry on. I think these cannas in particular are extra fast growing and borderline indestructible. You can always use a few plants like that! I hope your cannas pick up the pace now that things are heating up. I’m always surprised by how much further back you usually are, I don’t feel like you’re THAT much colder where you are, but I guess it’s enough.